It is a common trap to look only to hard data when making decisions. After all, numbers are clear and unequivocal. However, they don’t tell the full story of the data. Confounding variables and intangible effects color the results and complicate the data. 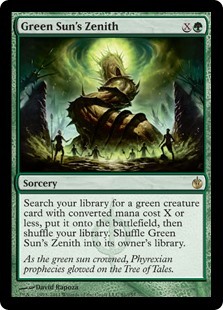 The data from my latest banlist test indicate that Green Sun’s Zenith is a powerful card in Modern. But the lessons I learned and the observations my team made about the test matches suggest that the card’s real power isn’t what we expected, both in usage and scale. I now think that GSZ could become legitimately broken if unbanned. This article marks the third in a series on Green Sun’s Zenith. If you’re just joining us, be sure to first read the Experimental Setup for this project, and then the Quantitative Results. A prominent argument I’ve seen against GSZ being unbanned is comboing with Dryad Arbor to become a ramp spell. Indeed, everyone told me I needed to include Arbor in whatever deck I used for the test. It makes sense as that’s the norm in Legacy, and briefly was in Modern. Dryad’s assumption has led some to suggest that GSZ could come off if Arbor was banned in its place. Discounting the fact that it’s ridiculous to ban a fairly innocuous card to make a powerful one reasonable, the point does stand that Arbor does grant GSZ significant utility, as Batterskull does for Stoneforge Mystic. Having tested with Arbor in my deck, I actually wish that I hadn’t. Dryad Arbor did not impress in my test, and its mediocrity there makes me question whether it merits an automatic slot in the GSZ deck. While I wouldn’t entirely discount the impact of Arbor with GSZ, I don’t think it really factors into whether GSZ could be unbanned or not. While not necessarily bad, I never wanted to use GSZ to find Arbor turn one. Most of the time, doing so would prove unnecessary, as Elves already had Llanowar Elves/Elvish Mystic on hand. Even when that wasn’t the case, it was generally better to save GSZ for a payoff card and/or play another one drop to set up an explosive turn two with Heritage Druid. It just felt inefficient as a ramp trick. This may seem odd since Legacy Elves often runs two Arbors. However, Legacy Elves isn’t really using them for turn one ramp, though that does happen. Arbor is there because it synergizes with the Legacy payoff cards Natural Order, Craterhoof Behemoth, and Gaia’s Cradle. Being able to fetchland for another creature generates a lot of mana in Legacy. Arbor also sacrifices to flash back Cabal Therapy, in Elves and elsewhere. However, Modern’s payoffs are all Elf tribal synergies. If Arbor isn’t ramping, it just doesn’t do anything. As such, I’m of two minds about the argument of Arbor’s universality alongside GSZ. On the one hand, it certainly could be done, as it’s fairly easy to cut a Forest for Arbor. On the other, is that something players will want to do? While it is relatively small, there is a cost to running Dryad Arbor in Modern. There will be times, just like in Legacy, where decks draw GSZ alongside their one Arbor and can’t ramp. There will be times where having Arbor in place of a normal land forces players to mulligan otherwise keepable hands. I think that a lot of players will decide that the benefits are worth the risk and run Arbor with GSZ. Having more mana early is very powerful. and Arbor is less space-intensive than just running more mana dorks. But verifying its viability once and for all will require more testing than I can manage. Due to the lack of payoffs other than ramp and Liliana of the Veil protection for Arbor, I’m skeptical that it will be universally correct. As such, I don’t think Arbor’s existence is a real help or impediment to GSZ’s potential strength in Modern. I did not fully appreciate the impact that playing multiple tutors had on Elves, perhaps because playable tutors are so elusive in Standard. The only straight-up tutor that sees regular play in Modern is Chord of Calling; the only deck I know of in Legacy with multiple tutors is Storm, which plays Infernal Tutor and Dark Petition. Vintage players have all the tutors, but they’re restricted. This impact of having multiple full sets of tutors in the same deck houses GSZ’s true power. Wizards doesn’t print tutors like they used to: just compare Demonic Tutor to Diabolic Tutor. They also don’t print them in the same quantity as they used to (see: the Enlightened Tutor cycle). Their reasoning is that tutors benefit degenerate strategies more than fair ones while making gameplans consistent to the point of being repetitive. There are correct lines of play in any given situation, and tutors make it easier to take those lines every time, whether the line involves finding the right answer or setting up a combo. This effect wasn’t obvious in exploratory testing or in my practice matches, but as the test wore on, I had flashes of déja vu. I was able to take the same successful lines over and over thanks to all the tutors in my deck. The games did feel quite repetitive towards the end. It was rare for games to be exactly the same, as variance affects both decks, but the tutor-heavy games definitely bled into each other. I would describe the effect of playing Collected Company, Chord of Calling, and Green Sun’s Zenith in the same deck as severely diminishing negative variance. It was like I took a variance sine wave and cut the bottom off. I don’t recall losing many games where I resolved two tutors. My opponents echoed my assessment. They consistently reported feeling up against the wall as I hit ideal curves so consistently. The games played out mechanically from their perspective, too. I was definitely going to hit payoffs and have big turns if my tutors resolved, and I ran enough of them to threaten it several times. That critical mass proved difficult to combat. Even my Storm opponent, with all of his cantrips, felt that test Elves was the more consistent and mechanical deck. An additional factor unique to GSZ is that it shuffles back into the library after resolving. In other words, it replaces the chosen creature with itself. The library’s size doesn’t change, but its composition does. On net, this means that with repeated uses, the odds of drawing GSZ increase. The probability of drawing another copy of the chosen creature drops by n-1/x, where n is the remaining copies of that creature in the library and x is the total cards in the library. The probability of drawing GSZ symmetrically increases by n+1/x. No other probability changes because the library’s overall size is unaffected. Therefore, GSZ is not only a tutor, but a way to improve deck composition during a match. I don’t know of nor could I find any mathematical or statistical model of the impact of this effect, but it feels like it should have some impact. If anyone has any guidance, please help me out. I did not appreciate that because I had multiple tutors in my deck, I could have pushed the Elves deck harder than I actually did both in-game and in composition. In normal Elves, it was correct to hold the actual tutor, Chord, for whatever I needed to win the game. I fired off Company anytime I could just for value. However, in test Elves, GSZ allowed me to smooth out and actually hit my ideal curve for a very low price. Chording for Heritage Druid was okay, but casting GSZ for it was busted. The way I ended up using my tutors was GSZ for power, Company for bulk, and Chord for specialized cards. This division of labor function frighteningly well. In hindsight, I believe I mis-built the test deck. I could, and probably should have, been Abzan Elves. Adding white improves the sideboard options, and having GSZ and Company to find the Elves lets Chord become a multipurpose toolbox. Having Selfless Spirit and/or Phyrexian Revoker to Chord for would have helped a lot against Tron. It also allows Chording for Eidolon of Rhetoric against Storm. I underestimated just how much more toolbox-focused Elves could become with GSZ. My other mistake was not appreciating just how busted Elves could be. There were a number of times where I had nine mana available turn 3. I didn’t record how many, because I didn’t realize that it kept happening until midway through testing. Had I been playing it, I could have GSZ’d for Craterhoof Behemoth and won the game, which I couldn’t quite do with Ezuri because of summoning-sick creatures. Given how easy it proved to generate absurd mana when I was hitting Heritage Druid every game, I should have cut Elvish Clancaller and some Shaman of the Packs for Craterhoof, Company, and more one-drops. It wouldn’t have been so grindy against UW Control, but the increased explosiveness would have improved the other matchups, and perhaps blitzed control regardless. The data show clearly that it had a significant impact on the deck’s win percentage. As I now believe, the test deck is suboptimal for GSZ; I think that win percentage could have been even higher. The intangibles also point to GSZ having effects that are less positive for Modern’s competitiveness and diversity. There is a lot of potential for GSZ to facilitate some truly degenerate combo decks. Given Magic‘s history, GSZ will almost certainly help green combo decks more than fair ones and will encourage fair decks to become more unfair. As a result, I think there is great danger in unbanning GSZ. I know that I was skeptical of Bloodbraid Elf and Jace, the Mind Sculptor when I tested them, but I believe this test is different. I predicted those cards would primarily impact fair matchups, particularly slower ones. That outcome would give decks with Jace and Bloodbraid an edge over similar decks without, and would eventually drive competitors out of the metagame. I would also argue that this exact scenario is playing out now: Jace is played in almost every UWx deck, while Jund is holding steady as Abzan and Mardu midrange decline. That said, the situation also seems to be fine for Modern as a whole. Unlike with Jace and Elf, GSZ carries the risk of breaking Modern in half. I had positive results with a beatdown deck, and yet I feel that I should have played combo. Had I been doing so, I definitely would have had more turn 3 kills, something Wizards wants to prevent from happening consistently in Modern. I suspect that in the event of an unban, players will happily run GSZ in GW Valuetown or Hatebears, but it will be Combo Elves or Abzan combo decks that really make the card shine, especially given how explosive Elves and Counters Company are already. The worst-case scenario for Jace and Bloodbraid was them pushing otherwise viable fair decks out of the metagame. With GSZ, the worst-case is combo decks just flooring everyone else with speed and, more importantly, consistency: fast combo is fine, but consistency is where the power lies. There are plenty of fast combo deck in Modern like Grishoalbrand, but they’re too inconsistent to be a problem. GSZ potentially making fast creature combo too consistent is a real threat. As the former result is less damaging than the latter, I remain against an unban. The nail in the coffin for GSZ is that I can’t imagine that Wizards wants Modern to have it. They don’t want there to be too much tutoring in a format, both for diversity of gameplay and as a check against degeneracy. Green creature decks already have Chord of Calling and Collected Company, and Abzan/Counters Company has been Tier 1 several times already. Traverse the Ulvenwald and Eldritch Evolution are also options, but they’re far more conditional and niche. Wizards also doesn’t want tutoring to be too efficient. I will argue that because GSZ finds a creature from your library and puts it into play for its converted mana cost plus one, it is the most efficient tutor ever printed. Other tutors have their CMC to pay, the tutored card is put into hand, and then players pay to cast the card. GSZ is clearly more efficient, and in Magic, efficiency is power. Chord and Whir of Invention cost triple colored mana plus the tutor CMC, which is a far greater ask for an effect similar to GSZ’s. Those times I could have had GSZ-for-Craterhoof on turn three, I couldn’t have quite hit Chord mana. In testing, GSZ just felt busted compared to Chord of Calling. For all these reasons, Green Sun’s Zenith strikes me as a high-risk, low-reward unban. The risk of degeneracy is high with any playable tutor, especially one as efficient as GSZ. Even if it isn’t actually degenerate, the additional tutor will push fair decks in a combo direction. That situation makes me think of Commander, where most decks include several tutors to facilitate multiple combos with their commander. I don’t think that making Modern more like Commander through adding tutors is a good thing, so I wouldn’t unban GSZ. Considering the effort Wizards puts into making formats distinct from each other, they are likely agree with my sentiment. Once again, thanks for investing the time in these tests and articles. This is highly appreciated ! Great article! I’d love to see you test Dig Through Time, Splinter Twin, or Ponder if you haven’t already. Dig has been in the voting several times now, but never gets picked. I imagine its time will come eventually. Twin has a number of problems that have kept it from being considered so far. The first has been that it’s just too close to the banning for us to really learn anything. It’s getting far enough away from that ban and Modern is sufficiently different enough that I could see doing Twin eventually. The main problem is that there really isn’t a good deck to use as the test deck’s control. Twin’s construction and gameplan have never really been replicated, so I don’t know how to approach building the deck or how to compare it. Ponder is tricky because I’ve already tested Preordain. That card didn’t impress, but it’s results were also suggestive that I wasn’t taking full advantage either. Ponder is in a different league to almost every other cantrip, and I imagine the test would just confirm that. It’s not a definate no, but don’t look for it either.